It's minus 24 at my house this morning, and here are some pix I snapped of the ISO-NE Real-Time system page. To me, the first one is the most telling: 20,000 MW demand, 243 MW in reserve. That's too little reserve! The rest are more typical winter ISO. 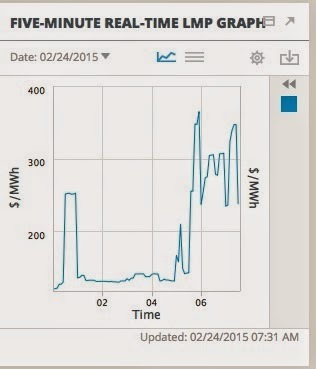 Grid running at over $200/MWh. Actually, it has been bouncing up to over $300/MWh, in the five-minute market. I just didn't get a screen shot at the higher levels. 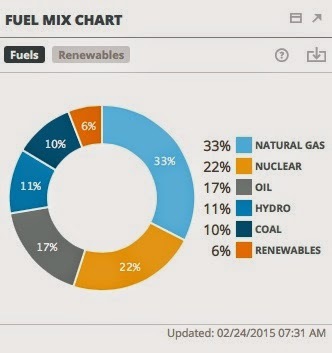 And here's the fuel mix: Lots of coal and oil, of course: total of 27%. Renewables hanging in at 6%. And the renewables chart. Wind is actually a reasonable part of it, since this has been windy weather. Wood and refuse dominate, of course. Of course, what is "reasonable"? 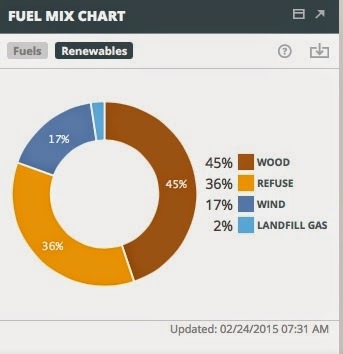 Wind is 17% of 6% on a day the grid is struggling. Our summer peak is above 20,000 MW, and today is only 19,000. However, in the summer, you can get natural gas to the gas-fired plants. The movie Blackhat was not nominated for any Academy Awards, but tonight is Academy Awards night. 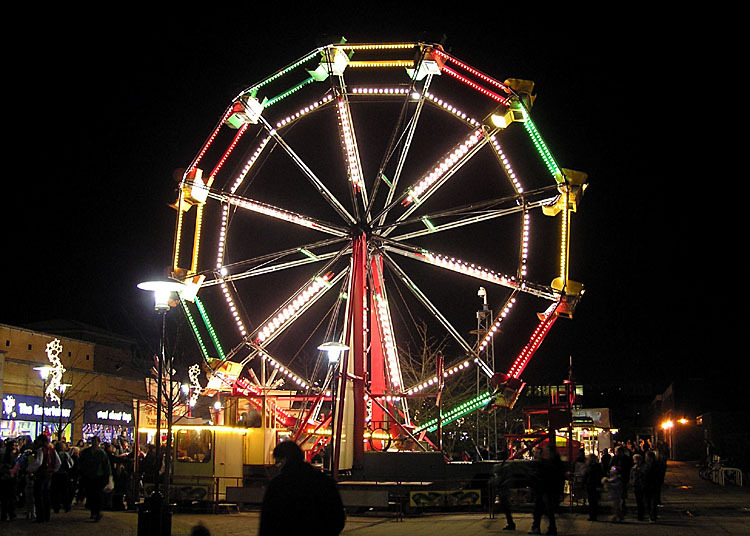 So the Carnival will start with a movie review. And not just any old movie review: a review of Blackhat by Dr. James Conca, at Forbes. On the eve of the Oscars, it’s fascinating to see another nuclear scare movie, Blackhat, trot out the nuclear accidents/nuclear terrorists as the ultimate threat to the world, even though it’s safer to work in a nuclear facility than in a department store. Of course, nothing about the nuclear plant in Blackhat is correct. I mean, full-length windows in a reactor control room? Are you kidding? Hollywood is not the only place that skirts the truth. There's an often-quoted post that claims that nuclear is not low-carbon. This claim is carefully and fully refuted. 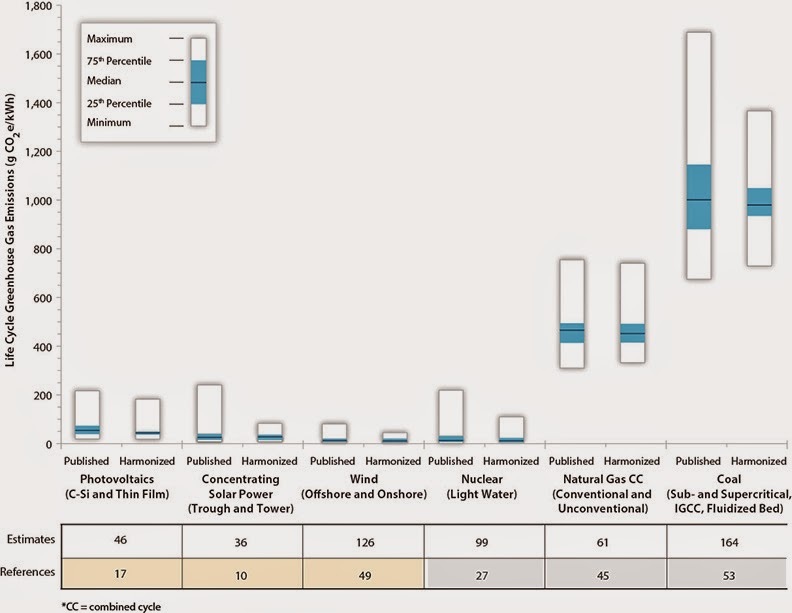 Point Refuted a Thousand Times: Nuclear is not low carbon? 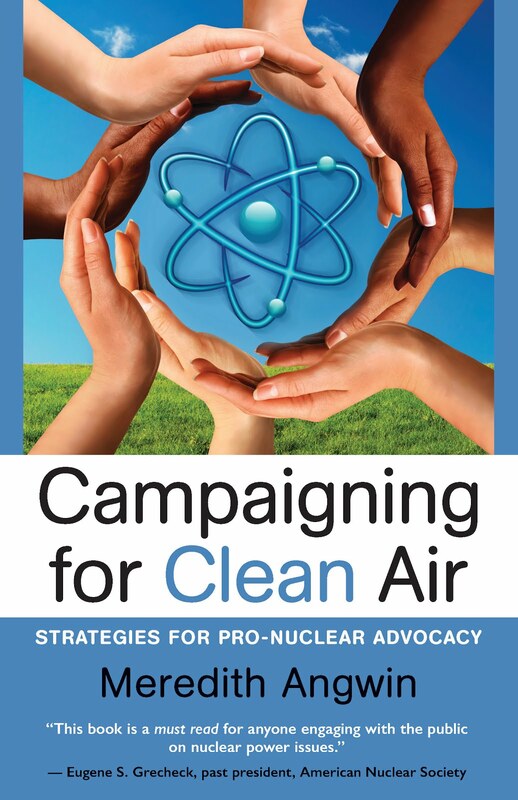 Lengthy, but necessarily long, rebuttal by guest Luke Weston who is responding to an often cited post about the carbon foot print of nuclear energy. On numerous occasions when Atomic Insights has mentioned using fast spectrum reactors as an additional tool in our quest for improving society’s power options, there have been comments that question their response in the event of rapid reactivity insertion accidents. They fear that fast reactors can suffer failures that carry the risk of harming the public. Some of the commenters pose their reservations in a credible way, suggesting that they have done some serious research and been unable to reassure themselves that there are good answers. Because they have been unable to find answers to questions that are worth worrying about if unanswerable, they are adamantly opposed to fast reactors. Rod Adams has found answers to those questions for a specific metal alloy fuel design that I hope will reassure both the specific people who have expressed their concerns to me and anyone else who might have heard or read something about the issue from other people who have been unsuccessful in finding answers. For the fourth time…Tepco should do the right thing and dump the fully treated Fukushima wastewaters to the sea. The only impediment is radiophobia; a mortal fear of detectable radiation embraced by millions of Japanese. Tepco seems more concerned about catering to unfounded fears than releasing the entirely harmless wastewaters to the sea. Entergy has requested the release of $18 million dollars from its Vermont Yankee decommissioning fund. The State of Vermont objects. Vermont wrote the NRC: Vermont wants to review such requests in detail, before any decommissioning funds are released. Armed with spreadsheets, an understanding of economics, and a clear mind (especially the clear mind), David Bradish of the Nuclear Energy Institute regularly crossed swords with vocal critics of the nuclear industry. 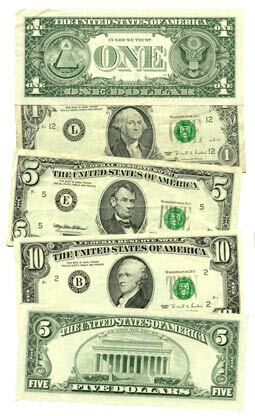 In blog posts and economic reports, Bradish demolished their arguments. Now, however, he is heading back to Iowa so his children can be near their grandparents. He'll be working for Wells Fargo on big data analytics. We all give a big thank-you to David Bradish, and wish him the best of luck in his new endeavors! 1) PSDAR: Entergy said it would finish its PSDAR (Post Shutdown Decommissioning Activity Report) by the end of 2014, although the NRC allows two years (till December 2016) for the report. Entergy completed and released the PSDAR on December 19, 2014. 2) Fund Payment: Entergy signed an agreement with the state for the last few months of the plant's operation. This agreement required Entergy to send various payments ($2 million for Windham Country economic activity, for example) to the state. All such payments have been made promptly. 3) Spent Fuel Management Loan: Entergy took out a $143 million dollar loan for spent fuel management, because the state wanted the fuel removed from the fuel pool very promptly. Strictly speaking, decommissioning funds are not supposed to be used for spent fuel management. The federal government is legally required to manage the spent fuel. Obtaining spent-fuel management funds from the federal government can be slow. The company has to sue the federal government, win the lawsuit, and finally obtain the money. Entergy said it would remove spent fuel from the fuel pool very promptly.The state wanted the spent fuel out of the fuel pool ASAP or sooner than ASAP. Entergy doesn't need to comply with "ASAP" but it is doing so. Amazingly, Entergy has arranged to borrow $143 million dollars for spent fuel management and moving the spent fuel into dry casks. This borrowed money will be repaid after Entergy sues the federal government. Note that taking out this loan was not in any agreement that Entergy signed with the state. Entergy decided to do this to speed up the process. It is possible that Entergy (with NRC permission) might have been able to borrow this money from the decommissioning fund itself. Of course, that would have depleted the fund and slowed the decommissioning. Entergy has done lots of planning, written reports, taken the fuel out of the reactor, arranged loans. All activities concerned with decommissioning the plant. So it requested permission from the NRC to obtain $18 million from the decommissioning fund. The NRC is in charge of the fund, and of decommissioning, and of ensuring that fund moneys are properly expended. The state objected. No, really, it did! 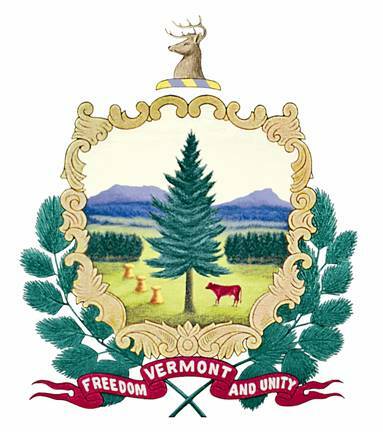 Vermont wants decommissioning very quickly but Vermont believes it has approval rights to determine exactly what the decommissioning funds are used for. In short: Vermont thinks the NRC needs state permission to release decommissioning funds. Indeed, the attorney general of Vermont and others in state government wrote the NRC to object to this withdrawal. Their letter claimed that the state has the right to review expenditures of decommissioning funds, and the funds should not be released, pending state review of the request. The state letter is posted in the Document Library of Entergy's VY Decommissioning website. The Document Library is a great boon to anyone who wants to follow this process. Though the state letter is quite long, the main basis of the letter seems to be the Memorandum of Understanding under which Entergy purchased the plant in 2002. A great deal of that memorandum is about decommissioning funds. The agreement states that, AFTER decommissioning is complete, Entergy must share 50% of whatever decommissioning funds are left over with the state. 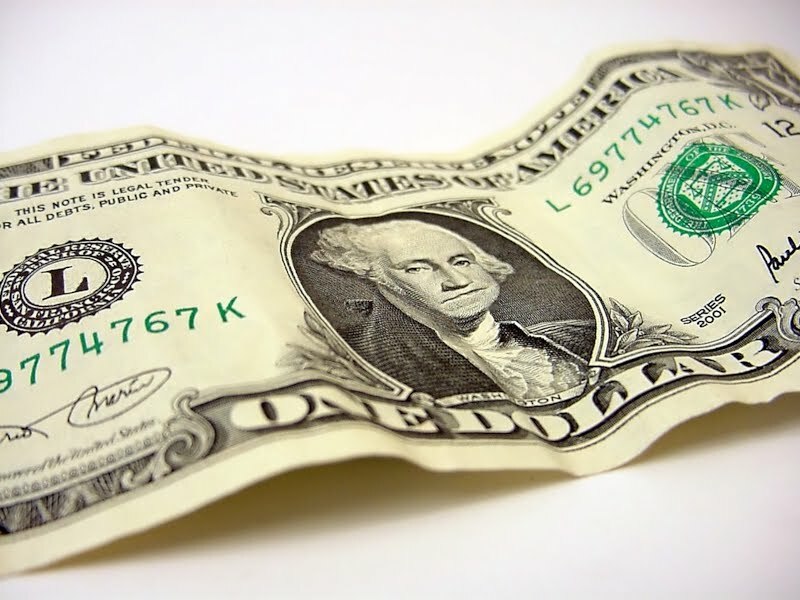 However, in the recent PSDAR, Entergy does not claim that there will be enough decommissioning funds available until the near the end of sixty years of SAFSTOR. The funds will grow, and full decommissioning will commence close to 2070, when the funds have grown enough to support it. In other words, concern with sharing excess funds with the state is a bit early and a bit theoretical! However, the Memorandum agreement that excess funds "will be shared" seems to have given the state the idea that the state has authority over how the funds are disbursed. But the state doesn't have authority. Yes, the state does have some limited say over how the funds are disbursed. If you look at item 7 in the Memorandum, the state must approve IF the funds are used for anything other than "qualified expenses." There is no reason to believe that Entergy's first request to NRC was for not-qualified expenses. Once again, the state is over-reaching. The state hasn't figured out yet that harassing Entergy with letters to the NRC and so forth will do no good. The decommissioning funds are the only funds available now for Vermont Yankee (except for the loan, of course). The NRC determines if the decommissioning funds are being used correctly. To me, this whole thing has unpleasant echoes of the time when the Vermont legislature tried to shut Vermont Yankee. They held a legislative vote that was basically all about safety. Entergy sued the state, and the legislature reacted swiftly to the lawsuit. They passed a law that Entergy had to pay the State's expenses in defending against Entergy's lawsuit. Of course, that law was illegal and nobody in the Attorney General's office would even try to enforce it. 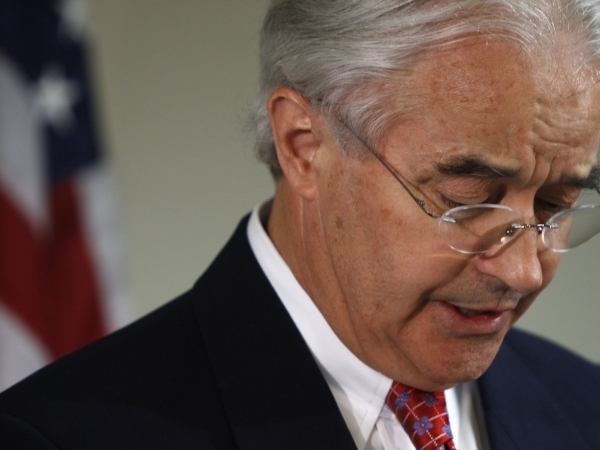 I wrote a blog post about this: Attorney General of Vermont Acknowledges "Shaky Concept" in Charging Entergy for Vermont's Expenses The Attorney General acknowledged that the the law was unenforceable. The Bank of Entergy was closed to the state. It's time for the state to acknowledge that that Bank of Entergy is still closed. I hope they acknowledge this before taxpayers (like me) once again fund a hopeless exercise in which Vermont attempts to change the role of the federal government and the NRC. These state-sponsored exercises are expensive. 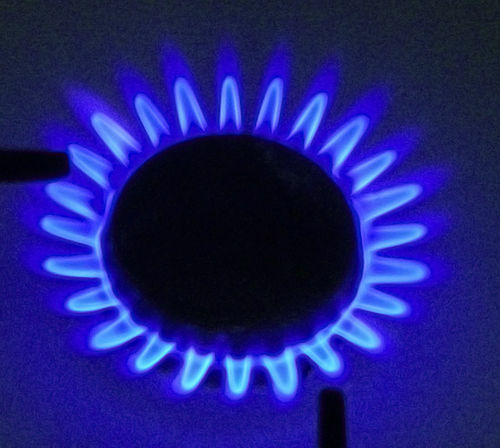 Around 2000, about 15 percent of New England’s electricity was made by burning natural gas. Gas was expensive, and used only during times of peak demand. The rest of the time, electricity was supplied by a mixture of coal, nuclear, oil and hydro. Back then, with only 15 percent of electricity coming from natural gas, pipelines to the Northeast were adequate. It was illustrated with a very nice picture of Vermont Yankee. The op-ed has appeared other places, also, including Vermont Digger, where it began to have a lively comment stream, but then a well-known anti-nuclear activist took over the comments. Meredith Angwin of the Ethan Allen Institute is a rock star among energy analysts, and she hits the right chord by blaming the recent run-up in electric rates on our big regional embrace of natural gas as a generation fuel. 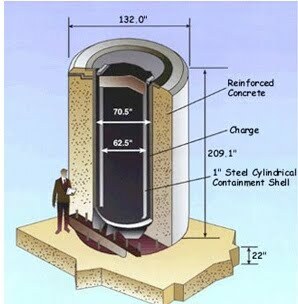 All the fuel has been removed from the Vermont Yankee reactor, and is now in the fuel pool. Please keep that in mind as you read the rest of this blog post. Weather Update: I have heard that the opponent's meeting tonight in Brattleboro has been cancelled due to weather. Ms. Kosterman is concerned with the spent fuel pool, the fact that Vermont Yankee is downsizing its staff, and the end of some types of planning and notification for the Emergency Planning Zone. Of course, she mentions the terrible situation of the Fukushima spent fuel pools where...well, actually, nothing happened at the Fukushima fuel pools, but she doesn't mention that. With Vermont Yankee downsizing its staff, is there enough security and oversight to protect citizens from terrorist threats? And, if we lose power due to severe weather or if the grid goes down for any reason, will the backup generators be sufficient to cool the spent fuel pool to ensure public safety? She recommends writing the NRC during the decommissioning comment period, and asking them to deny any request by Entergy that lowers the company's expenses for safety-related funding. Well, yeah sure. That was a letter from a member of the local anti-nuclear campaign. Surely the state government takes a more realistic view? (Recchia) said the state is evaluating an appeal to a decision by a federal panel that approved the elimination of the data system. He said he has “deep concerns” about the safety of the plant without the state being able to monitor radiological conditions in the spent fuel pool..... Without the data management system, the state will not have real-time access to the conditions in the pool. Apparently the state feels it needs and deserves real-time data on the fuel pool. On February 19, in Brattleboro, the NRC will hold a meeting on the Vermont Yankee decommissioning report. (I recommend the Entergy's VY Decommissioning web site for access to all reports.) The opponents are gearing up for this meeting by hosting two preparatory meetings, one in Brattleboro on Monday February 9 (I have heard this meeting has been cancelled due to weather), and one in Montpelier on Wednesday February 11. The opponents don't seem to know that the reactor is shut down. A quote from the Montpelier meeting announcement: With the slow motion Fukushima disaster highlighting the vulnerabilities of Mark 1 reactors, how will the state deal with the increased vulnerability of this aged reactor? Hey guys....news flash! The reactor doesn't have fuel in it! The fuel has been removed! The reactor is no more vulnerable than any other large inert piece of metal. Sigh. Sometimes, "respecting your opponents" can be uphill work. With or without my respect, the opponents are getting ready to confront the NRC again. Leslie Sullivan Sachs, a leader of an anti-nuclear campaign, wrote this letter to The Commons: You Don't Need to be a Rocket Scientist. Her letter focuses on being heard at the February 19 NRC meeting on Vermont Yankee decommissioning. Note: Howard Shaffer also has a comment on the Sachs letter. His comment is excellent and worth reading. I don't think the anti-nuclear groups are equally afraid of a closed plant and an operating plant. However, I do think they are afraid of losing their funding. Because, after all, if you successfully "eliminate the danger" by closing the plant, people may begin to direct their donations and their activism elsewhere. To maintain funding, you have to say that the plant is still very dangerous. If a plant being decommissioned is as dangerous as an operating plant, then the fear goes on. And with the fear (with any luck), maybe their donations will go on, too. New England is at a crossroads. One choice is to continue on the road now traveled, with natural gas for electricity production exceeding that of coal, hydro and nuclear power combined by 2018. 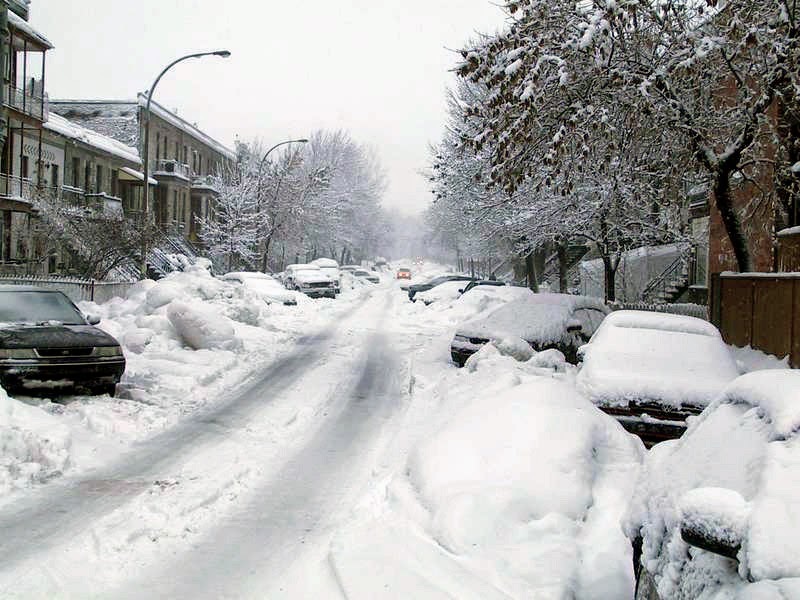 Due to a shortage of gas-pipeline capacity, we are already experiencing high prices for home heating and electricity. And there has been a decline in air quality due to the increased use of coal plants to meet electricity needs and the loss of Vermont Yankee’s 600 megawatts of emission-free power. The other choice, the path we should be taking, is to maintain a balanced mix of low-carbon energy sources, including the Seabrook and Pilgrim nuclear plants with licenses renewed, wind and solar power. (It is always understood that on the use side, we must do the maximum conservation and efficiency.) This would enable the plants to continue running for another 20 years or longer. With less reliance on natural gas for electric power generation, households and businesses would benefit from lower energy costs. But for that to happen, the EPA will need to modify a proposed rule to cut carbon emissions from power plants. As the rule is now written, it is rigged against nuclear power, even though the U.S. fleet of nuclear plants accounts for nearly two-thirds of the nation’s zero-carbon electricity – and they will become increasingly important as more coal plants are shuttered. The proposed rule – which would require New Hampshire to reduce its carbon emissions by 46.3 percent compared to 2005 levels by 2030 – shortchanges nuclear power, the one technology that could make a decisive contribution in the battle against global warming. Nuclear plants are a dependable source of electricity, because they produce “base-load” power about 90 percent of the time, underpinning the stability of the electricity grid. But currently, New England’s deregulated electricity market does not recognize nuclear power’s environmental value or its critically important role in maintaining power reliability. New England’s regional and state power authorities need to make the changes necessary to ensure the continued availability of nuclear-generated electricity, which is much cheaper than most other alternatives. 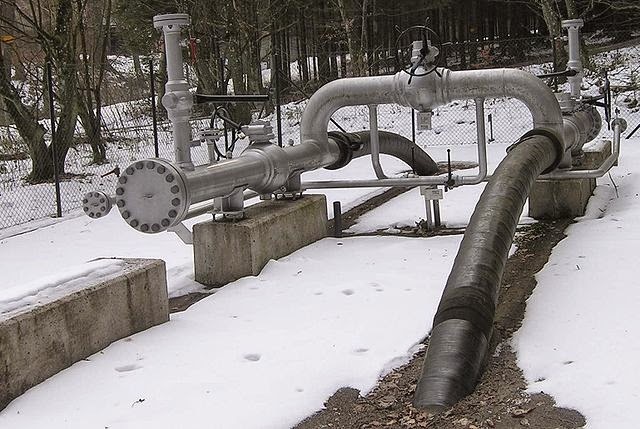 At one point last winter, during the polar vortex, 75 percent of New England’s natural-gas generating capacity was not operating due to lack of supply or high prices. 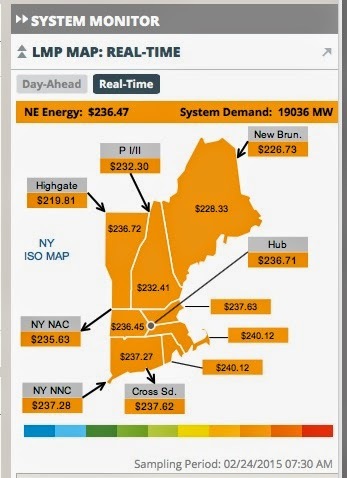 Public Service of New Hampshire resorted to burning costly jet fuel to meet the demand for electricity, while the price of oil rose to more than $400 per barrel. Imagine what would happen if the Seabrook and Pilgrim nuclear plants are shut down. Once a nuclear plant closes, its license terminates. The price of electricity would skyrocket. Let’s make sure that doesn’t happen. 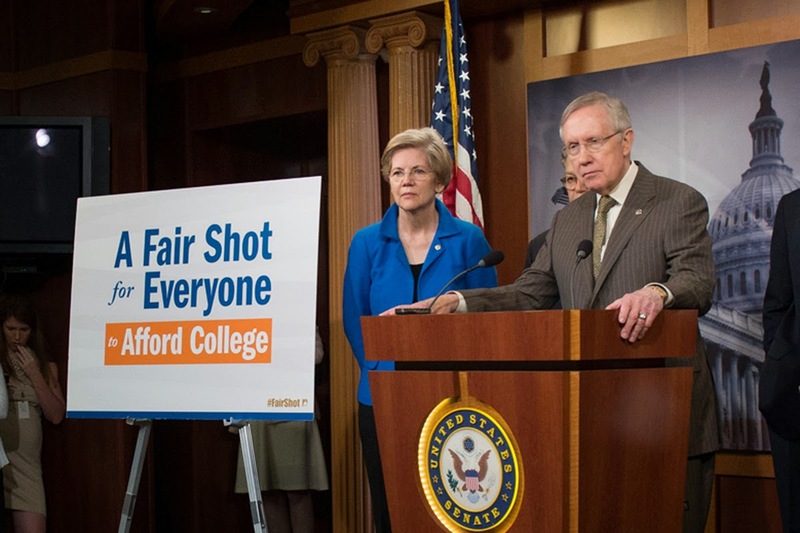 This column by Howard Shaffer first appeared in the Concord Monitor, on January 28, 2015. Shaffer holds a M.S. 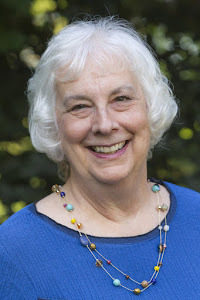 in Nuclear Engineering from M.I.T., is a registered nuclear engineer in Vermont and New Hampshire, and was a start-up engineer and systems engineer at Vermont Yankee. He is a featured writer at this blog. Well, the first question might be...why is this even a decision? Of course, we always move forward with lessons learned. 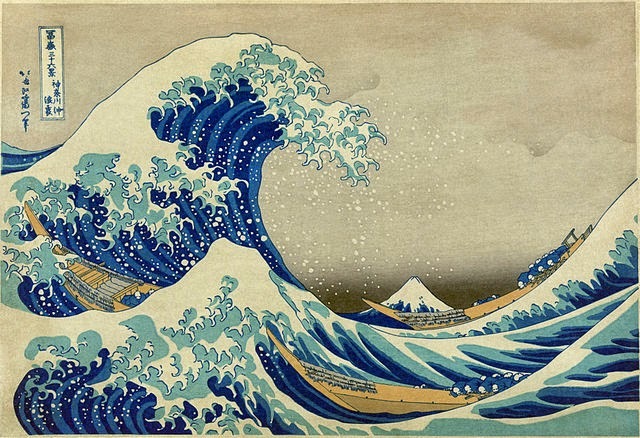 We learn lessons when problems occur (like tsunamis at nuclear plants). We implement fixes. How else would technology advance? Various groups are attempting to accelerate the increase of carbon dioxide in the atmosphere. (Yes, these groups call themselves "nuclear watchdogs" and environmental groups, but I calls them as I sees them.) These accelerator groups wanted all GE Mark 1 reactors shut as a response to Fukushima. In April 2011, one of these groups filed an "emergency enforcement petition" to the NRC to shut all such reactors immediately. As reported by NucNet, on January 23, 2015, the NRC rejected this petition. It stated that lessons-learned were being implemented, including a huge FLEX program of backup power equipment. This first pro-Vermont Yankee decision can be restated: We fix problems, we don't throw away technologies. Yes, this does seem obvious. No, I don't know why it took the NRC over three years to make this ruling. 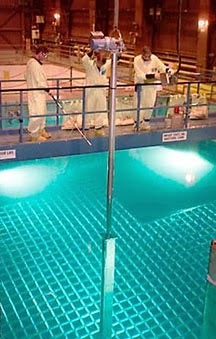 Entergy has removed all fuel from the reactor, and it is now in the fuel pool, cooling. According to Entergy and NRC calculations, after fuel has been out of the reactor for about a year, the fuel pool is no longer in danger of having a fuel pool fire (not that there was very much danger in the first place). However, the state of Vermont requested a hearing asking the NRC to make Entergy "either keep its ERDS (Emergency Response Data System) operational or provide a new, equally effective monitoring and warning system" as long as fuel remains in the fuel pool. (Quote from article by Nuclear Street.) On January 28, the NRC ruled against the state. The NRC ruled that Entergy can stop staffing and supplying an emergency warning systems after fuel has been in the fuel pool for a year and three months. MassLive has an article which links directly to the ruling itself. As a matter of fact, I have embedded the ruling at the end of this post. Yes, once again, this seems obvious. When there is no danger, you don't need a warning system. Still, if you go to the Vermont Yankee Decommissioning web site and then go to the Document Library for NDCAP (the local decommissioning panel), you can see a summary of the comments that have been filed with the Vermont Public Service Board. As the summary states: By far, the most common request in the received comment sets was the retention of the current 10-mile Emergency Planning Zone (EPZ) beyond the planned “hot wet” spent fuel storage period (i.e. beyond April 2016). In a total of 41 public comment sets, 32 sets requested retaining the current EPZ at least until all spent fuel is moved to dry cask storage. 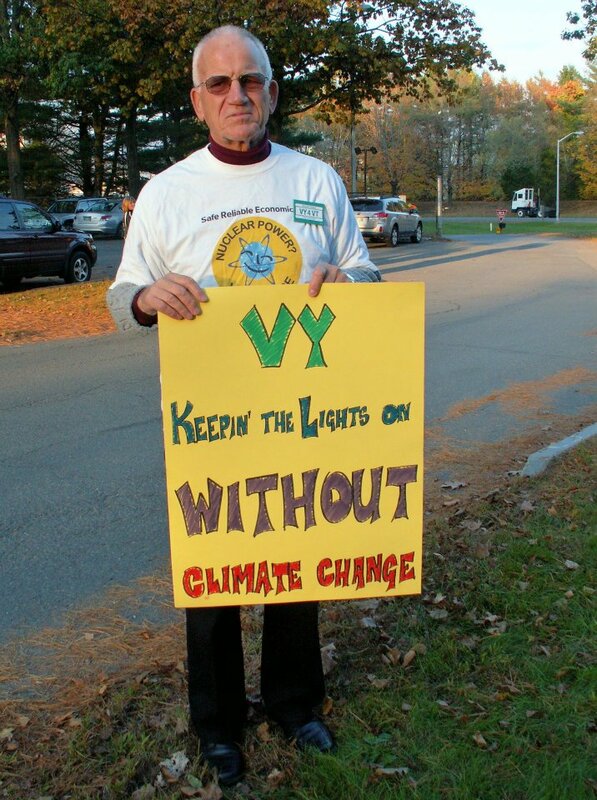 Many people in carbon dioxide accelerator groups apparently still feel endangered by Vermont Yankee. This is true even though there was very little danger when the plant was operating, and negligible danger now. I understand fear. I am myself a cowardly person. So I have some advice. I have used this advice on many occasion--- for myself. When I have an exaggerated and unreasonable fear, there is one person in charge of reassuring me and handling my emotions. That person is me.